The Walter Camp Football Foundation has announced the Football Bowl Subdivision National Offensive and Defensive Players of the Week, presented by Generation UCAN, for games ending September 29. About the Award: This is the 15th year that the Walter Camp Football Foundation will honor one offensive and one defensive player as its national Football Bowl Subdivision player of the week during the regular season. Recipients are selected by a panel of national media members and administered by the Foundation. McKenzie Milton accounted for six touchdowns (4 passing, 2 rushing) as 13th-ranked UCF defeated Pittsburgh, 45-14. Milton passed for 328 yards (18-of-34) and four touchdowns, and rushed for 51 yards and two more scores as the Knights improved to 4-0. Notes: It is the second time that McKenzie Milton has earned Walter Camp Player of the Week honors (Nov. 26, 2017) and the third UCF honoree (Terrance Plummer, LB, Oct. 12, 2014). Jerry Tillery tied a school record with four quarterback sacks as 8th-ranked Notre Dame defeated 7th-ranked Stanford, 38-17. Tilley (6 tackles, 2 quarterback hurries, one forced fumble) led a Fighting Irish defense that held the Cardinal to just 31 offensive yards and three points in the second half. 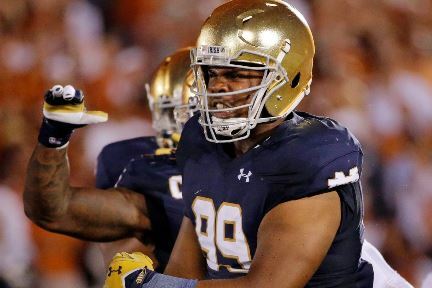 Notes: Jerry Tillery is the eighth Notre Dame player to earn Walter Camp National Player of the Week honors since 2004, and the second this season (Khalid Kareem, DE, Sept. 2).